We all love to know what’s open and what’s closed during a snowstorm, especially our schools. Like much of what goes on at a liberal arts college, the open vs. shut question isn’t so, well, open and shut. 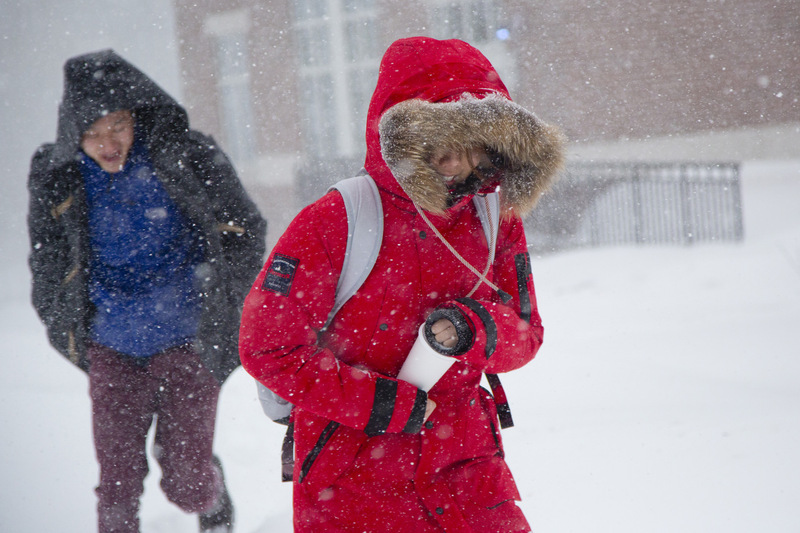 During a weather emergency, like the Jan. 27 blizzard, administrative offices close, except for essential operations, such as Dining Services along with Security and Campus Safety. 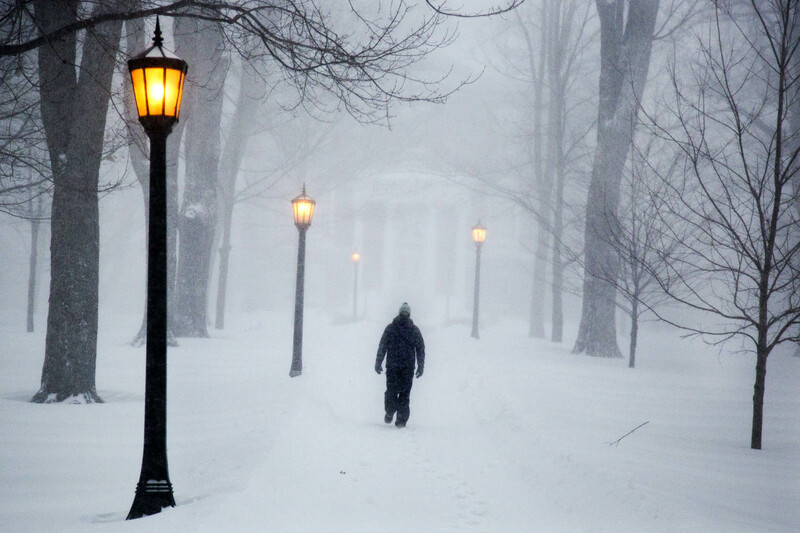 And reflecting the time-honored tradition of the faculty’s academic authority, each professor decides individually whether to hold or cancel class. But just because a faculty member can’t make it in, class might still go on. Unable to lead his class, politics professor Bill Corlett sent a back-up plan to his students the night before, asking them to convene and take up a question. 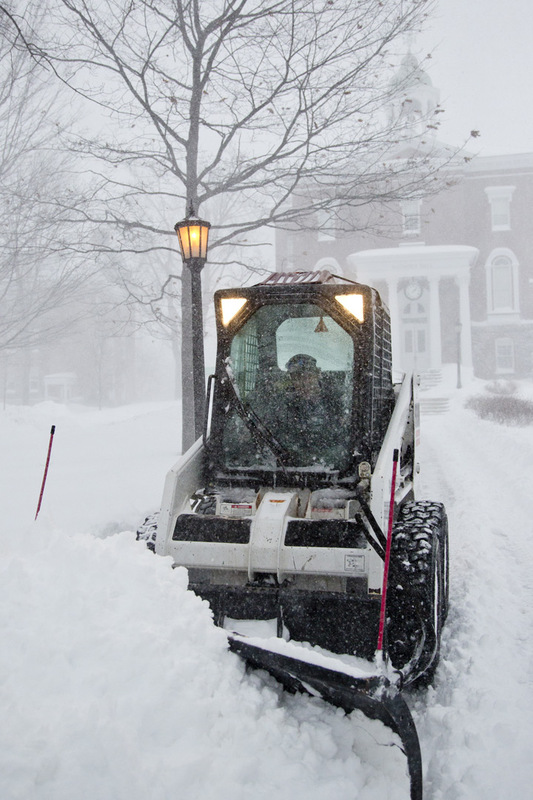 Whether doing their own thing or doing what they were asked, Bates people kept the college moving forward despite 27 inches of snow, 11-degree temperature and wind gusts of 45 mph. 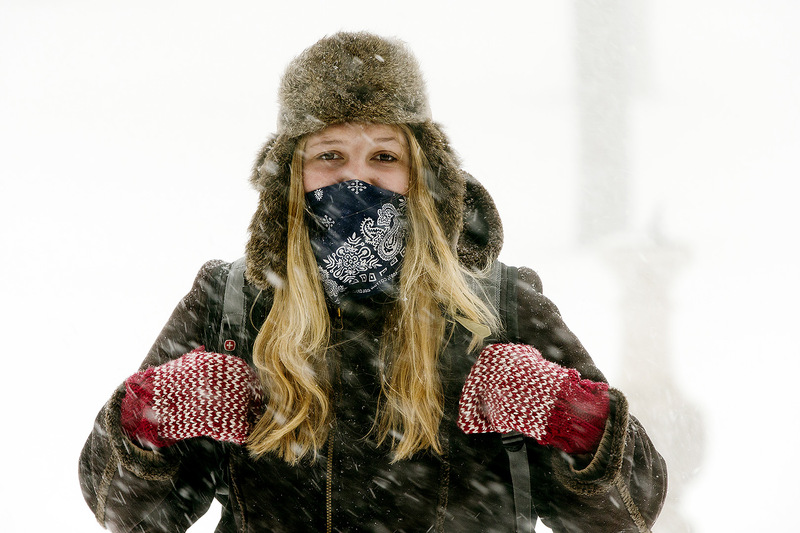 “I consider myself a fairly tough Mainer but even with bundling up this morning, it seems like I was no match for today’s blizzard,” says Sarah Stanley ’16 of Springvale, Maine, an environmental studies major. 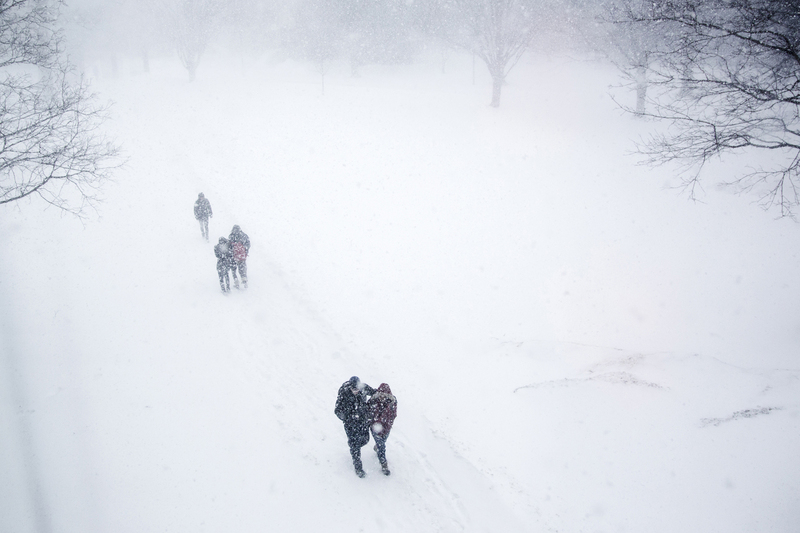 Storms bring people closer together, like these students who paired up as they made their way across the Library Quad. 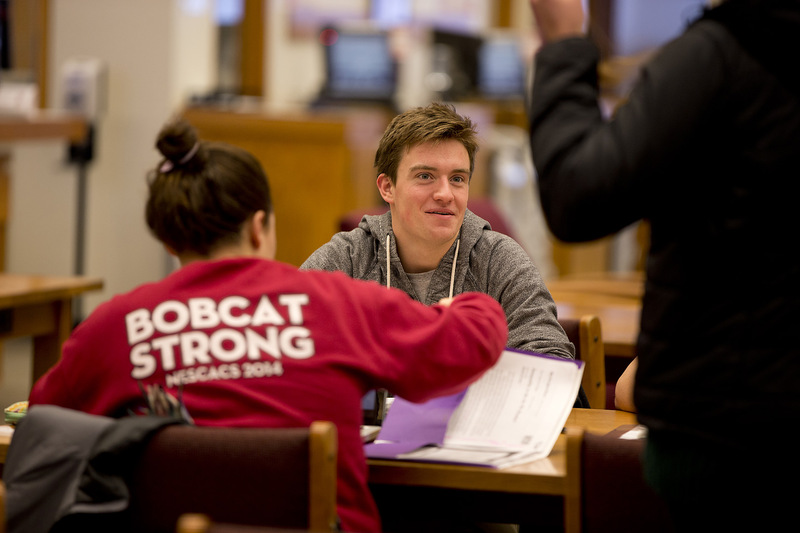 Mitchell Rider ’17 of Louisville, Colo., and Melissa Paione ’16 of Auburn, Maine, study and stay warm with friends in Ladd Library. 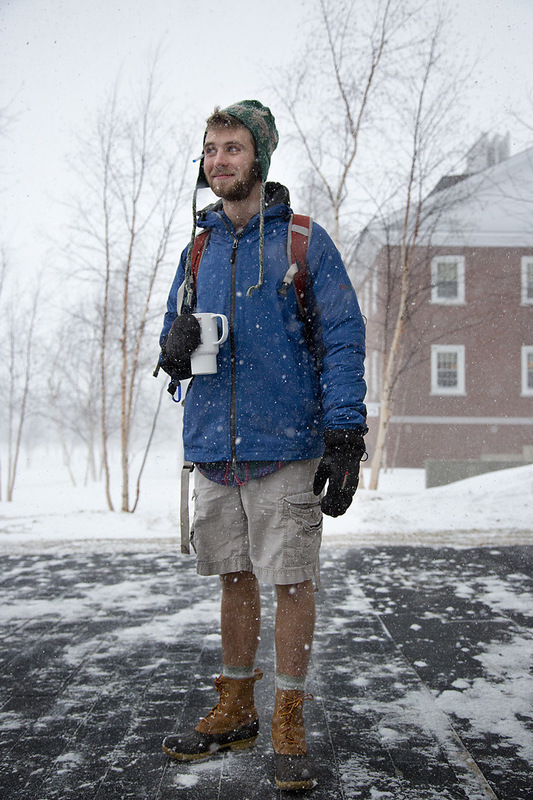 “I’m from North Carolina, so I’d rather not walk through two feet of snow to get to class,” says Jack Edmiston ’16 of Mooresville, N.C., heading to Carnegie Science to hand in a lab assignment to Assistant Professor of Physics Nathan Lundblad. 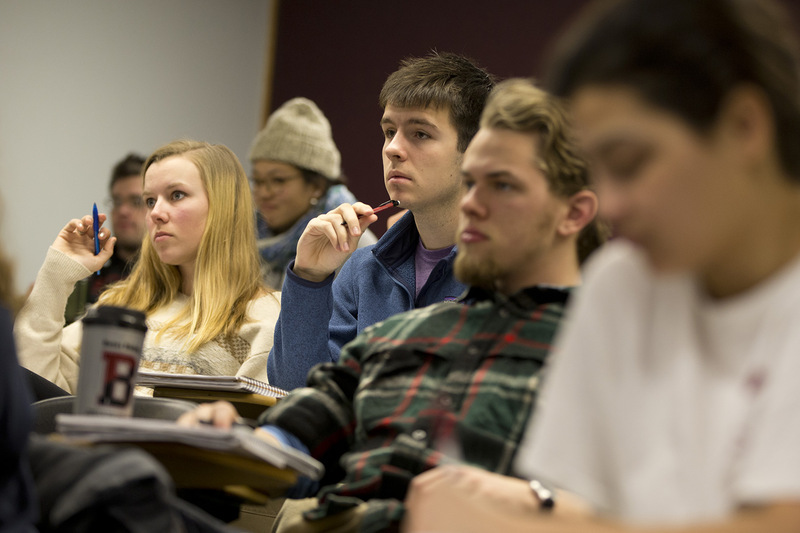 Students listen to Professor of Geology Dyk Eusden ’80 in their “Earth Structure and Dynamics” class in Carnegie Science. The lights are on and a lot of people are staying home during the blizzard. 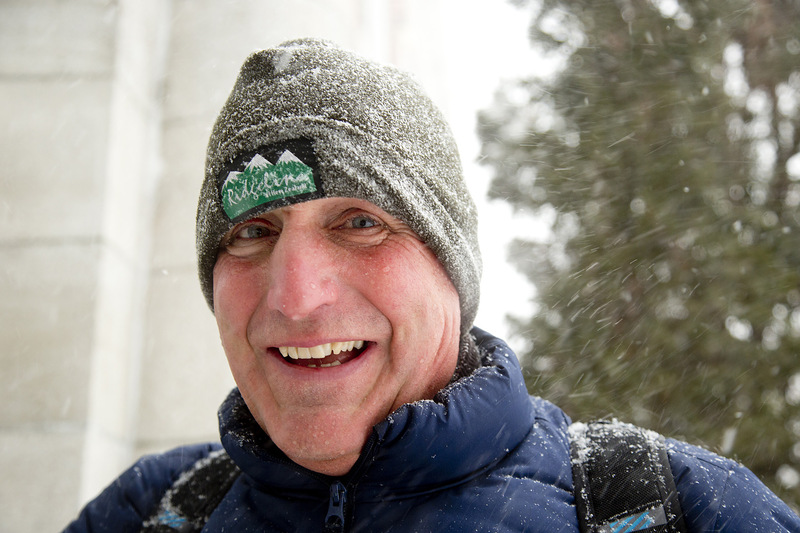 Mike Adams of Facilities Services takes on the snow. Hathorn Hall stands sentinel behind man and machine. Keenan Shields ’18 of Pittsford, N.Y., is on his way to his class in microsociology (the study of everyday details of how people create, maintain and respond to social structures and relationships). He says that wearing shorts has been a part of his identity for so long that he’s not quite ready to give up the habit. 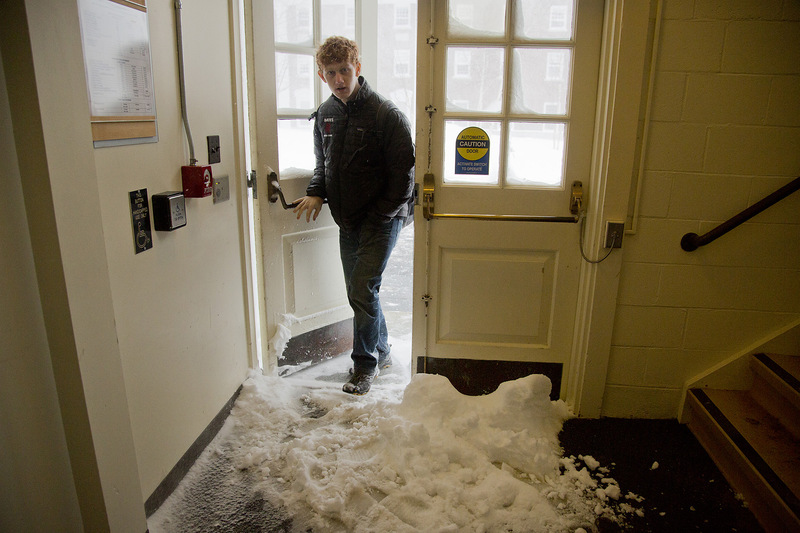 Snow, blown inside each time the door opens, greets those who enter Hathorn Hall from its Alumni Walk entrance. Students head downwind along Alumni Walk. 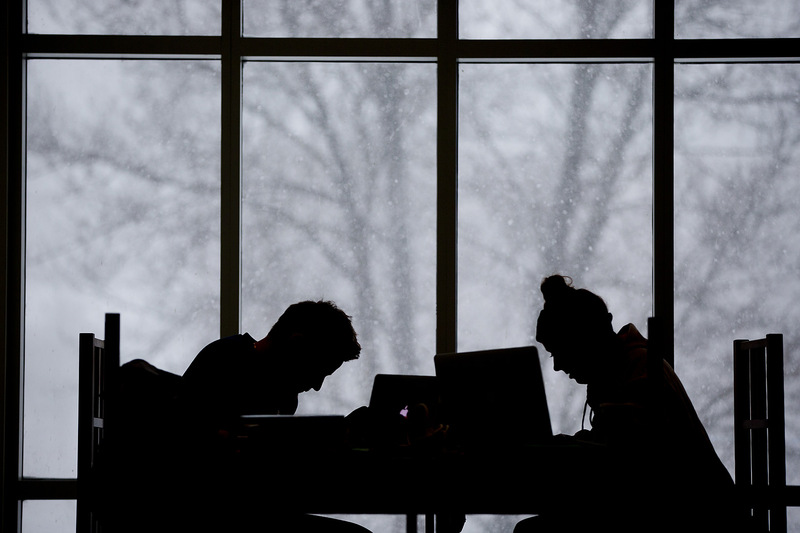 As the storm rages outside, Pat Sheehan ’18 of Springfield, Ill., and Julia Rosen ’18 of Weymouth, Mass., study in Perry Atrium for a multivariable calculus class. 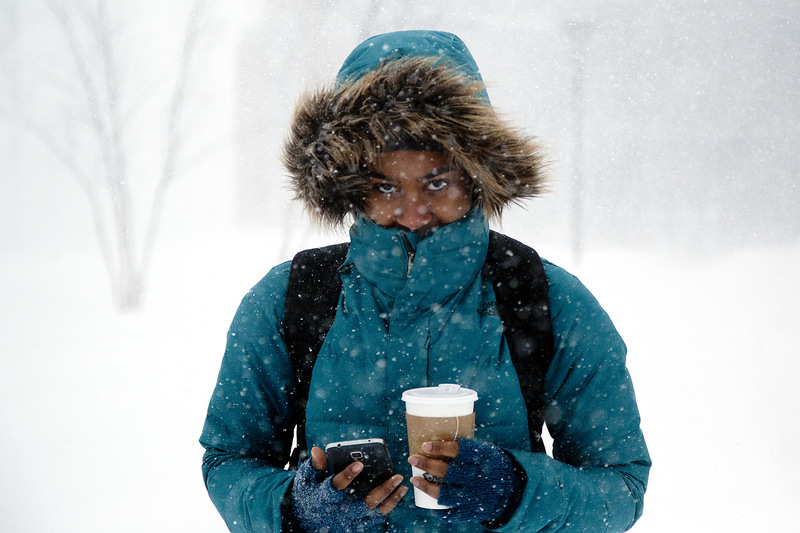 Tea in one hand and phone in the other, a bundled-up Essence Hill ’17 of Chicago pauses for a portrait. 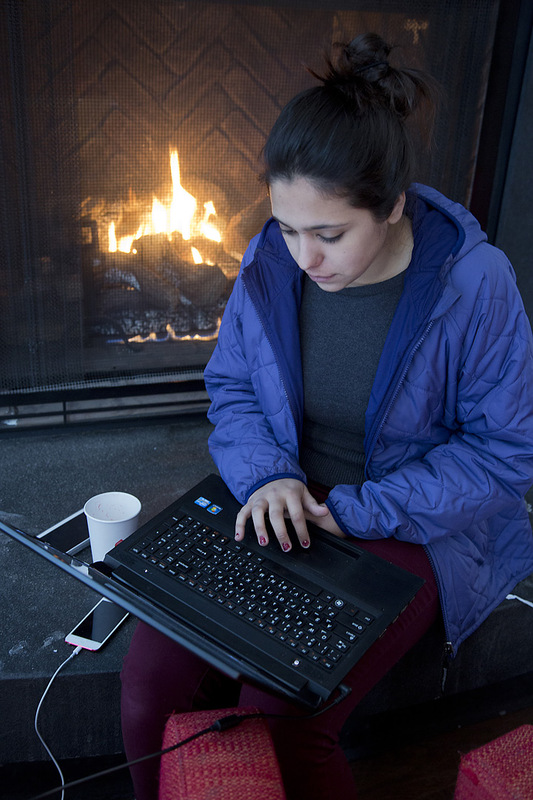 Saleha Belgaumi ’18 of Karachi, Pakistan, studies in the Fireplace Lounge of Commons, close to two sources of comfort: warmth and food. 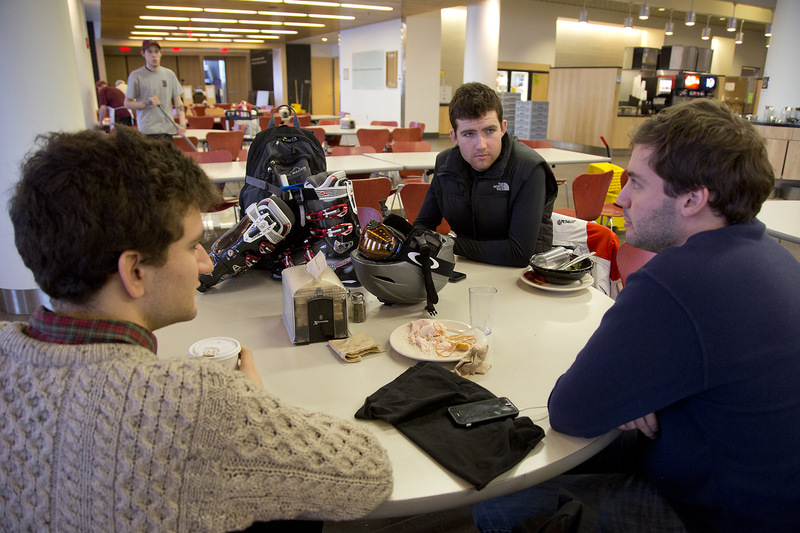 Bates debaters Matthew Kahn ’16 of Newington, Conn., Matthew Summers ’15 of Short Hills, N.J., and Chris Crum ’17 of Littleton, Colo., discuss issues of equity in public education. 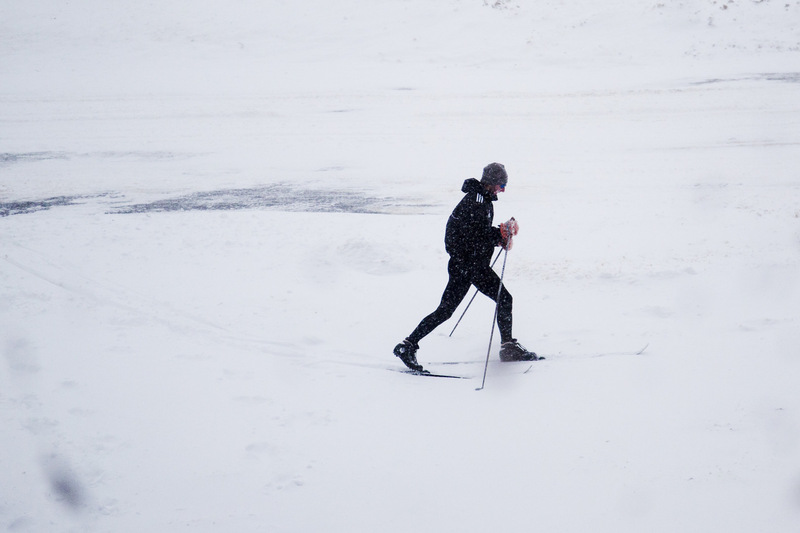 Earlier in the day, Crum had skied on Mount David. 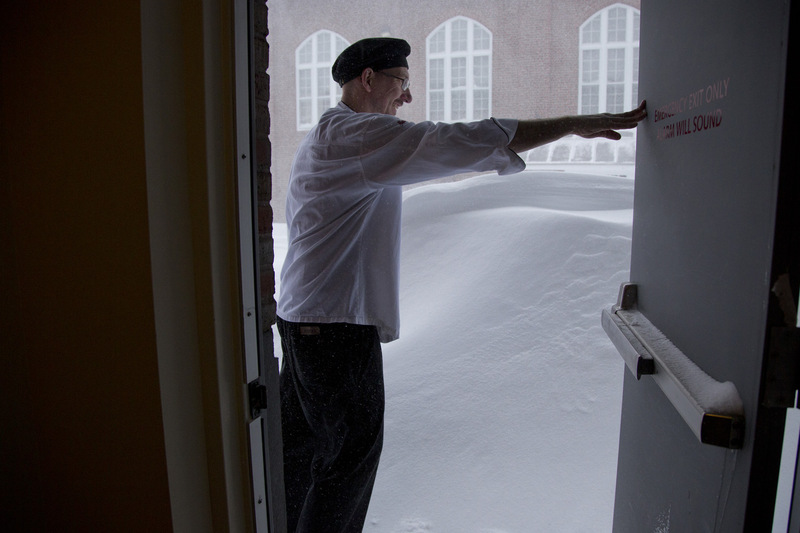 First cook supervisor Michael Staffenski checks the weather conditions, and a sizable drift, outside a rear door of Commons, facing Alumni Gym. 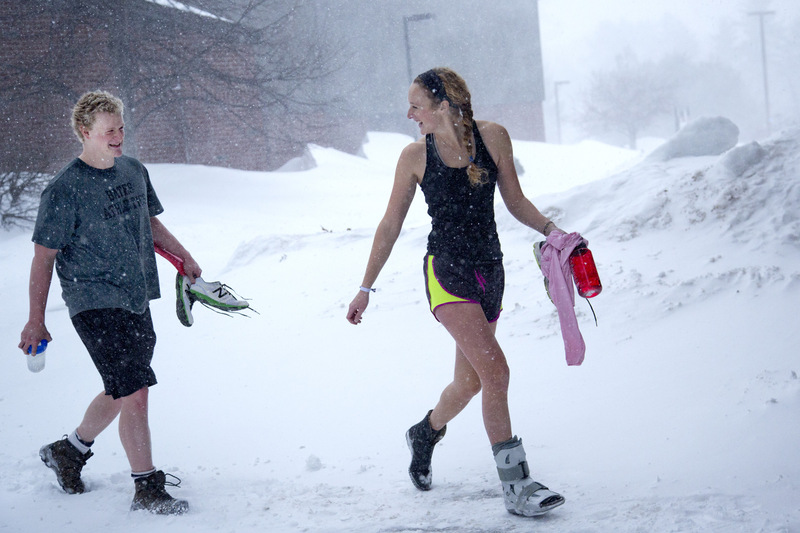 Alex Arau ’16 of York, Maine, cross country skies down Central Avenue near Commons. 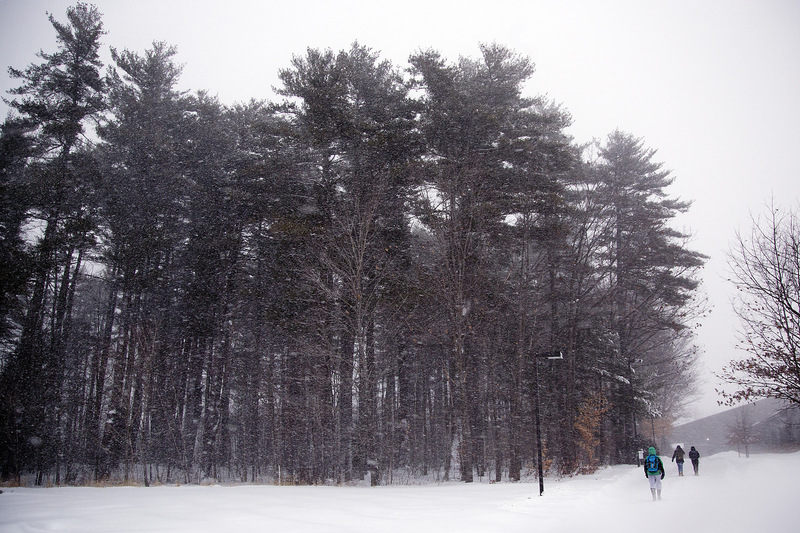 The Merrill Woods loom over students making their way toward Underhill Arena and Merrill Gym. Will Patton ’15 of Asheville, N.C., and Emma Conover ’16 of Camden, Maine, leave a workout in the Davis Fitness Center for their respective swimming and rowing practices in Merrill. It’s a great day for a Bobcat swim team picture. 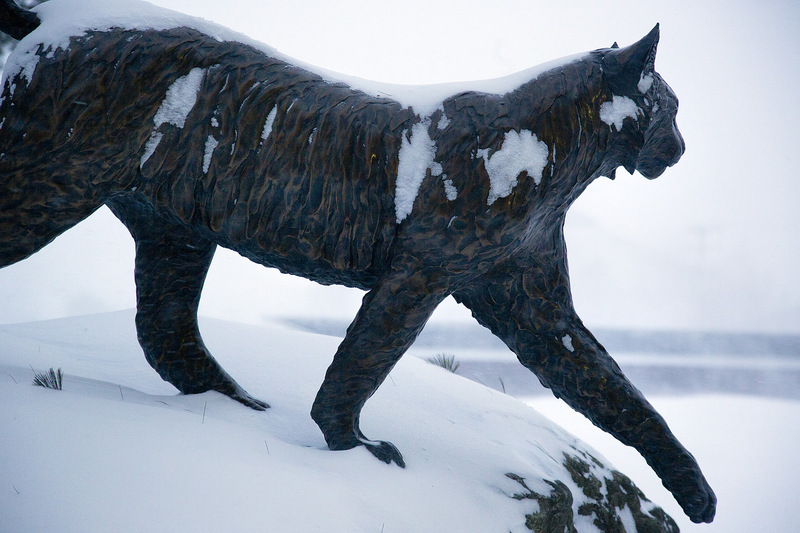 Storm, shmorm: The Bobcat seems impervious to the storm. 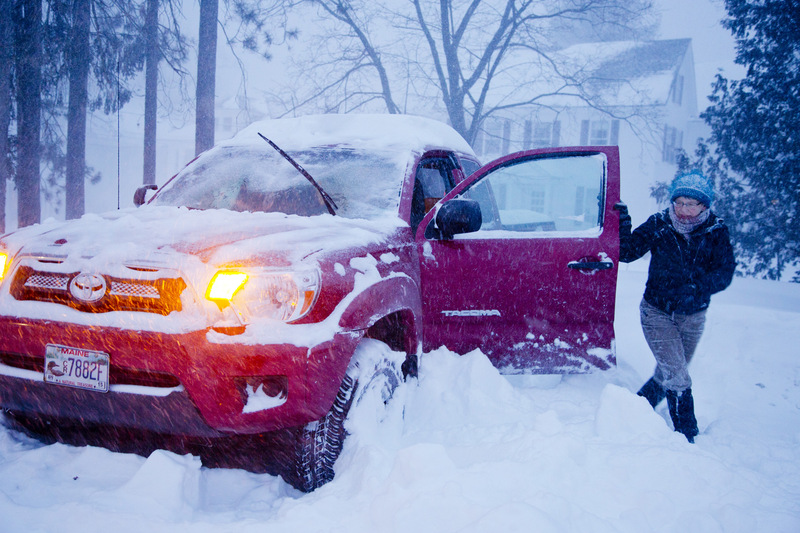 In the Campus Avenue parking lot, Associate Professor of Biology Nancy Kleckner readies her vehicle for travel.